Our Margate Personal Injury Attorneys have represented hundreds of people that have been injured in both Margate, Florida and throughout the state by no fault of their own. Our lawyers are available by appointment to meet with you at our Margate office, your home, the hospital or at a location that is most convenient for you. 1. Make sure that our client is receiving immediate and appropriate medical treatment. 2. Our attorneys will take all necessary steps to preserve all available evidence from the scene of the accident. Preservation of evidence could require obtaining photographs of the scene, videotaping of the scene, obtaining statements from any witnesses, obtaining police / accident reports, obtaining video surveillance from any cameras surrounding the scene of the accident, and immediately hiring experts to investigate the accident scene. We have an on-staff investigator that is responsible for accident scene preservation. In 95% of the Margate, Florida accident cases that we handle our accident attorneys can tell you within a matter of minutes whether you have case. The best way to know if you have a case is to call us for a free phone consultation. Whether you are a Margate resident or were injured in Margate, our attorneys are available to discuss your recent accident. 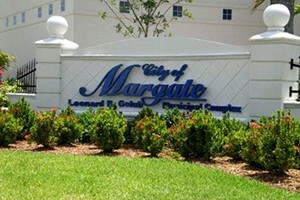 The city of Margate, Florida is located just north of the busy center of Fort Lauderdale. It is an extremely diverse community with residents hailing from around the Caribbean, including Haitians, Colombians and Jamaicans. Due to its close proximity to Fort Lauderdale, many Margate residents commute and rely on the highways and roads to get to work and back daily. This large volume of drivers often causes slowdowns and traffic accidents on the busy roads, including the dangerous I-95. In 2008 alone, there were 97 crashes which led to 109 fatalities on the Broward portion of I-95 alone. Additionally, due to the temperate climate of Margate, residents are afforded an active lifestyle, including motorcycling, bicycling, and other outdoor activities. At times, these activities can be dangerous and regrettably, accidents do occur. As such, there are many hospitals to serve the population, including Northwest Medical Center and Broward Health Coral Springs Medical Center.